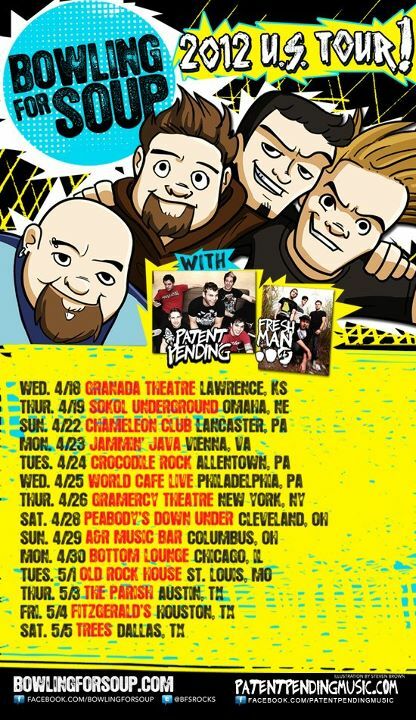 Pop punk band Bowling for Soup will be stopping in at Croc Rock in Allentown on Tuesday, April 24th. Bowling For Soup first drew attention with their second album Drunk Enough to Dance and their single “Girl All The Bad Guys Want”, which brought them their only Grammy nomination. Two years later, in 2004, they hit the Billboard Hot 100 with their (very catchy) “1985”. Their most recent album, Fishin’ for Woos, was released in April 2011. With them will be Freshman 15 and Patent Pending (one of our favorite pop-punk bands ever). Side note: World Cafe Live is about the same size as the Artsquest venue. Can we get some shows like this there? Please?